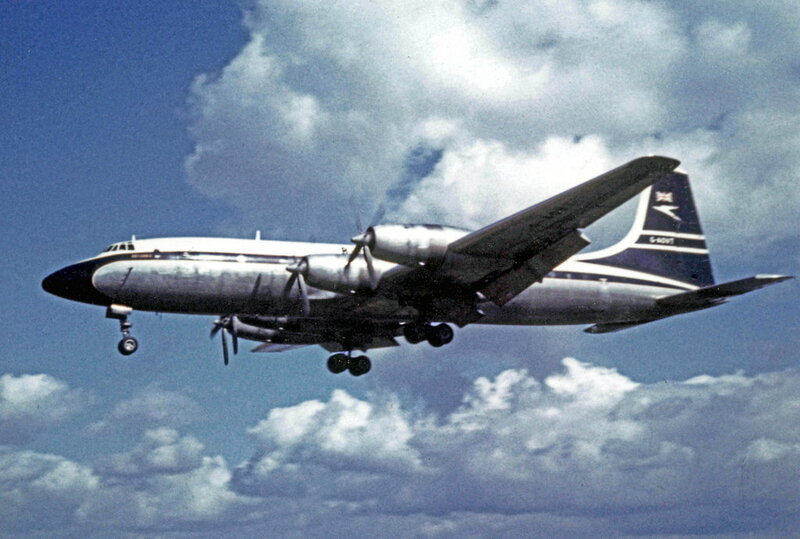 May I refer people once again to this podcast of D. P. Davies recounting some of the early problems when certificating the DH Comet (47 mins in) and the Boeing 707 (1hr 14mins in). Sometimes, designers and manufacturers take short cuts and sometimes the regulatory authority becomes 'too close' to the manufacturer. The 737 has morphed a long the way from a small shorthaul aircraft to something much larger, more powerful and with considerably greater range. This old 1960s design has needed many add-ons and modifications to achieve this. I do wonder whether this was a wise path to follow, and I also wonder whether the FAA has neglected to maintain sufficient distance when approving some of these changes. I'm just curious what will happen when it's completely clear that two totally serviceable airframes were wrecked (this might not be entirely fair to the ET309 crew) by less then competent crews. Will all these regulatory bodies require demonstrated proficiency in raw data flying across all phases of normal operations? This is a public forum that is obviously used as a simple source by the media. I would suggest instead of just cursoring past the top post on Rumours & News people should read it: BrandinettIB's Global Announcement - "Notice regarding post responsibility and anonymity. "PPRUNE will not guarantee your anonymity in such situations." "Ethiopian Airlines has decided to send the black box from its crashed airplane to Europe for analysis, rather than to the United States where the Boeing 737 Max 8 was manufactured. The decision, in defiance of U.S. requests, is the latest sign of the world’s growing distrust of the United States on aviation safety issues. While U.S. regulators and Boeing have continued to insist that the Max 8 is safe, most other countries have ordered the grounding of the aircraft, leaving the United States increasingly isolated on the safety issue." Much appreciated if other members can post the link. Garneau's bafflegab seems to be hinting at crew training, that the Canadian industry is up to speed on the Max, but many other countries are not. Since he cannot discriminate against foreign carriers vs domestic ones, he's just shutting it down. Not sure the logic for ever opening up again - Canadian approval of all foreign carriers' training programs? Or just assurance that whatever mishandling or malfunction cannot ever happen again because of an additional layer of automation. He sounds like all the rest of the internet-whipped politicians instead of an engineer/astronaut. Ethiopia crash FDR/CVR recorders to go to Germany on insistence from Ethiopia investigators. As noted Canada is grounding all of its Boeing 737 Max 8 aircraft and banning the jet from entering its airspace until further notice as safety concerns continue to mount following the two crashes. 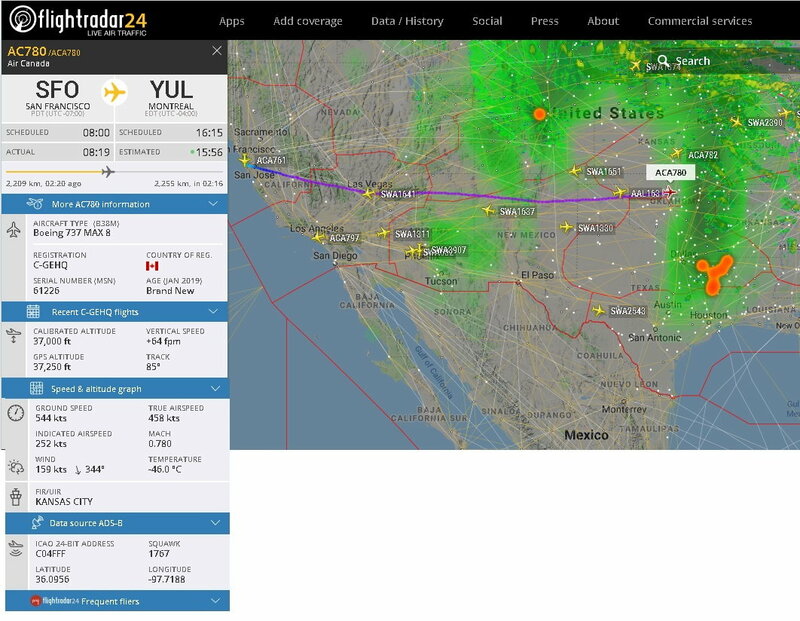 Air Canada WestJet and Sunwing all ground their jets. Kayak Travel Agency booking search engine will have a ''I do not want to fly on a 737 Max'' option button. Small point but there are numerous modes and sub modes in most FBW aircraft software that are not taught and can influence the operation of the aircraft be it Boeing, Airbus or any other manufacturer. Re. MCAS, is the use of trim for this role not slightly inconsistent with traditional flight control philosophy ? For example, if Boeing engineers had done "PAT" then it would be uppermost in their minds that the purpose of the trim tab is to RELIEVE elevator pressure, not apply it - i.e. it's a secondary control surface, not a primary one. So the question arises, why not make control yoke pressure the activation trigger rather than angle of attack which should be responded to by primary flying controls, not secondary ones ? Poldek77: It does look as if one of them landed at Ankara. It disappeared off the plot when I was tracking it and i assumed it had continued to Dubai. The other that was in the air at that time was OK-SWA and that one landed at Tunis at around 22:10. I note the explanations provided by Dave Reid & quentinc; thanks for those. I have a long experience with the safety of nuclear power reactors and their operation. We often have three requirements on a critical measured value. Perhaps this kind of safety philosophy is too expensive to be used in modern commercial aricraft? All the required parts must be available today,. I'm confused about the FR24 reference, though. Their subscription plans grid does indeed state that Gold members get access to geometric height, but I've just replayed a selection of Max 8 flights (Air Canada, Icelandair and LOT) and for every one the GPS altitude on screen stays stubbornly on "N/A". Indeed yes, I think you make an important and very valid point. I am surprised the FAA allowed this single point path to be approved. May I refer people once again to this podcast of D. P. Davies recounting some of the early problems when certificating the DH Comet (47 mins in) and the Boeing 707 (1hr 14mins in). Sometimes, designers and manufacturers take short cuts and sometimes the regulatory authority becomes 'too close' to the manufacturer. Love the story in this interview, about spinning a Viscount. (10 min in). And then doing a flick roll and spin in a Britannia. Last edited by silverstrata; 13th Mar 2019 at 18:17.
just as fast as speculation fueled hysteria started - it will fade and joe public will go back to not caring in the least which variety of jet they are on. Dismissing PAX concern based on widely reported concerns about possible inherent problems with the Max 8 as "hysteria" is the opposite of a safety-first mindset. You know no more than I do if the two incidents are direct, indirectly or not at all connected. But PAX see the same almost brand new derivative 737 jets crashing, in similar circumstances, without obvious cause, killing a JT610 and ET302 combined total of 338 PAX and crew. That undoubtedly concentrates the PAX mind. One looks like a misfortune, two looks like carelessness, n'est pas? If the questions we're all asking remain unanswered for some time, as seems likely (the Lion Air investigation is still on-going), then the Max 8 will remain grounded everywhere, except the US (for now), until otherwise determined, perhaps for many months. Anything other than a very short suspension of use looks very bad. Heaven forbid any Max 8 still flying goes down... And you really think PAX will forget and not care? I don't need to tell anyone here of the long-term reputational consequences for types like the Comet, DC10, Concorde, or Fokker 28 not only for the model, but also for their manufacturer. If anything the digital age makes this potential damage more severe because the story will remain out there, just as Max 8s stay in their hangars and airlines seek compensation from Boeing for the groundings. I'm sure the US government will protect Boeing whatever happens, but the same may not be true for the future of the 737. The penny has just dropped - GPS altitude is displayed for live flights, but not on replay. "A spokesman for Germany’s Federal Bureau of Aircraft Accident Investigation is telling The Associated Press that the agency was asked by Ethiopian authorities to analyze the black boxes from Sunday’s plane crash but declined because it lacked the necessary software. Spokesman Germout Freitag said Wednesday that he doesn’t know where the black boxes will be sent next." The MCAS shouldn't engage based upon angle of attack only. If the MCAS engages based upon AoA in combination with airspeed, it would prevent most, if not all erroneous MCAS activation. Or better yet, engage based upon AoA, airspeed, and altitude. This is one of those situations where regardless of what the truth is for a specific incident, the pressure generated by the perceived reality must be a good thing by forcing action where it clearly was not urgently felt enough. It's entirely possible the latest ET incident wasn't related to MCAS, but there's absolutely 0% chance that the concerns about MCAS are immaterial to safety at this point, so what better time to use public opinion to pressure Boeing and the US regulatory agencies to address this? Sure, the counterargument is along the lines of "How do you know it wasn't urgently felt enough? You shouldn't rush something like this, Boeing needs time to..." to which the response is, you're telling me before being rushed they were deliberately continuing to put planes in the air that were and are unsafe, know about it and that wasn't cause for shutting things down and/or creating urgency? Not an argument anyone with any logic education under their belt wants to be on the side of. Point being, engineering reality aside, political reality is in a perfect spot to force action. This is, undoubtedly, positive pressure, even if it isn't pleasant in the short term. One would think flight crew, cabin crew, ground crew, passengers, beancounters and everyone else could agree on at least the importance of the urgency of addressing whatever the concern is with systems, regardless of why it's being addressed. I don't think that I voiced an opinion not readily apparent to anyone who has actually flown an airplane of any sort. In the end we're dealing with trim which is the single most intuitive element of flight for even a novice pilot. "Zeroing out" pressure on the stick/yoke is probably the first thing that became "second nature" to me in my own limited experiences. As you grow in proficiency trim becomes even more valuable... So it's impossible for me to get beyond the fact that the captain of flight 610 wrestling with multiple oscillations due to intermittent runaway trim failed to follow the established procedures outlined by Boeing? So if your a media member and you happen to read my speculation why not start at the beginning and ask a few simple questions. What role is automation meant to play in commercial aviation and why does the FAA require (and has even increased it requirements) a higher level of experience then any other regulatory body for aviation globally? Is there a correlation between the FAA's confidence in air safety in the United States and those requirements? What are the requirements of the MPL (the fast growing global alternative) and what level of proficiency does a newly minted MPL cadet have? Maybe from the FAA, but not so fierce when they use the Party System (c.f. TWA800, Boeing withholding critical information and the Rand report which still has not been implemented as far as I know).